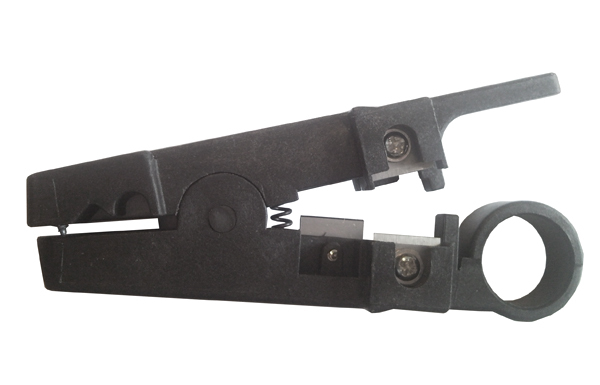 Flat wire stripper,pull out type for: Stranded phone wire 2P,4P,6P,8P,10P,etc. Intercom/alarm wire/2-cond,speaker wire 18-22AWG and SPT-1 electic wire. Round-cable stripper w/guides,by rotating 1 to 3 times at counter-clock wise for: Round cable-tough platic insulations 12-14-16 awg cable,SPT-2 elecric wire. Assorted solid modular wire:UTP,STP,DATA communication wire and network cable. Multi-conductor cable:Insulation O.D. Automative/heavy-duty wire MAX 8 AWG Adjusting bolt control for fixed size avaliable for matching different cable sizes. Sharp SK-2 Blade for cutter and stripper can be replacable.